Welcome to Casa Las Mujeres Bailando (House of the Dancing Women), hich is proudly managed by North American Standards (Nasplaya). Casa Mujeres Bailando sits on the sunny side of the Casa del Mar Condominiums, a new high-end development on beautiful Coco Beach. This beautiful 2 bedroom 2.5 bath unit has it all. 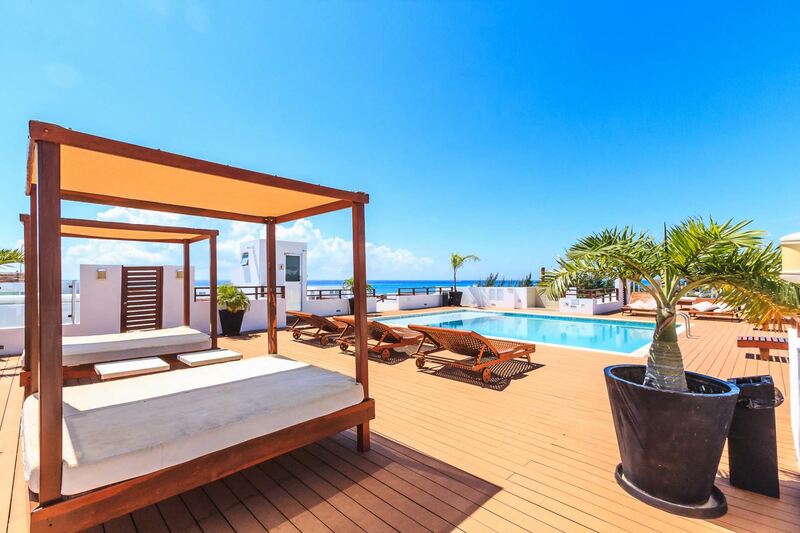 Walk 50 feet to the desirable and spacious cool white sand beaches and warm turquoise waters of the Caribbean Ocean or 5 minutes to the trendy happening Mamitas Beach Club. You are still only 2 blocks from 5th Avenue with it’s pedestrian promenade full of high end boutiques, relaxing coffee shops, gourmet restaurants and cool bars. This beautiful condo has high quality finishes, art and linens to give you a totally pampered feeling. 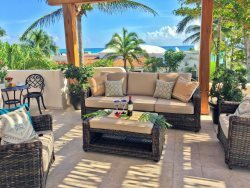 A full length terrace accommodates outdoor grilling, dining with friends and of course a Margarita. The gorgeous rooftop pool with its spectacular views is a perfect place for a sunset gathering.